Why bother to reply with you did? are you that easily manipulated by words from a stranger on a anonymous forum on the internet? You need to seriously take a look at yourself if you are, which it really does seem so based on your reply. You wrote , "have you tried this with other buildings, monuments, an piece of fruit, a turd found on the street left by your neighbors dog? I cannot now engage you in a serious conversation about my opening post, although some would say no one could lol, but for those that do, i hope we can be civil in the language we use, and not include TURDS as an analogy. why do keep playing games? If you don't want to answer, why reply at all? Funny that you asked that with how you are replying. Its a serious question with a bit of humor added because you created this plan which I quoted you doing. i then had the idea of putting the times of the clock on the circle , and for some reason i wanted the equilateral triangle to have its base set horizontally , thereby making the base correlate to the 8 Oclock and 4 Oclock position . This is why I asked if you have tried this on other structures and dates you may come up with. I posted it, not any of our friends. I asked in a more serious manner in my last reply. How easily you get upset by your own misinterpretation and assumptions are just beyond me. why you keep replying to things that you misinterpret and do so in a way to derail your own thread just shows who has the mentality of a 12 year old. IkNOwSTuff and I are both ignorant to subjects such as this but I would think a day then is nearly the same as a day now, a year then was nearly the same as a year now. I don't think the calendars we use now would matter too much. 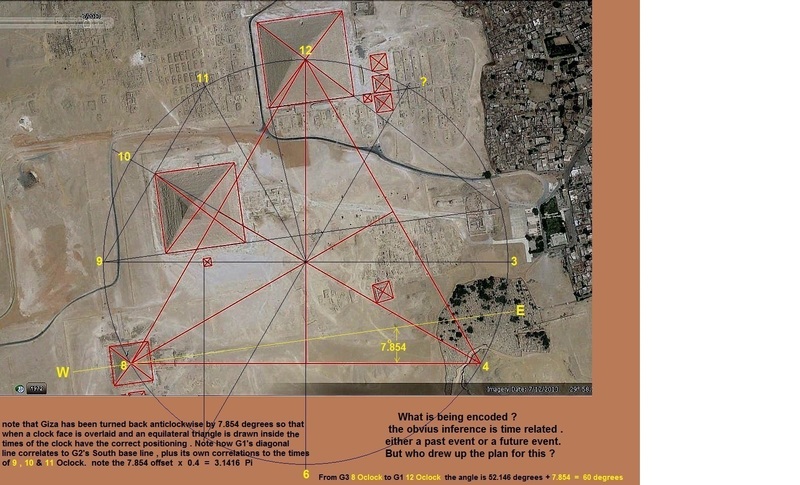 What would matter is the period or dates the pyramids were built and compute the math from that date. Edit: This comment may be stupidity at work here. No stupid questions and i include myself in that! But, in short, no. The reason being that it is accepted that we have "lost" some years in the calendar crossovers since the accepted AD timeline (possibly 6 years) which would affect the OP's figures. Also, is his start point the beginning or the end of construction of the GP? The currently accepted consensus is 20 years from start to completion which, added to the lost years, would make a large difference to the OP's figures. You know there's that saying; 2025 is the new 2012. Ok let's drop (for the time being) my main post headline about a future date being encoded via the times on a clock face, as its bringing the obvious questions that i can't answer to any logical level. Let me ask this, could the guys of those times transfer a 2 Dimensional diagram (from who knows where and when) and upscale it onto their 3 Dimensional topography , assuming this drawing was handed to them by an outside source one would think there would be two sets of linear units of measure. So to make the transfer work from the outside unit to their present day unit a conversion figure would be needed to make the plan work, so once they were given the figure to calibrate the conversion to their units they could start building, 70 years later we have Giza. Now what if the guys who drew up the plan couldn't help but build in some sort of homeland signature into one of the pyramids, take the King's Chamber Volume figures for instance based on its dimensions that are Length 412.4" x Width 206.2" x Height 230.42" . Hopefully a mothership will land and put an end to this Jihad!! Just worked out how to post a pic, due to this sites 4 hour time out on editing, so i can't attach these to the appropriate posts . Well done for putting all the maths work in there! However, a simple question occurs to me - as there was no Julian (or even Gregorian) calendar when the pyramids were built, would those dates actually mean anything? They obviously have more significance to us these days but that is we because we have proscribed significance to our current calendar. This isn't an attempt to troll here, it is more a genuine question of curiosity. Clearly the builders were cleverer than you. It was always meant to be this way, until it’s not, then we move on.